The Troy-Bilt string trimmer is made by the MTD company, so there is a great similarity between the Cub-Cadet model line, also. Troy-Bilt offers a wide variety of trimmers aimed primarily at the homeowner to light-commercial market. The product line includes both 2 stroke engines (lighter, but need to mix oil with gas, and more polluting) as well as 4 cycle engines (heavier, no need to mix oil with the gas, cleaner burning). Troy-Bilt does not have a dedicated dealer servicing networks, as is the case with the premium trimmer brands. The lower priced models are often available at home improvement stores nationwide. Due to the popularity of these units, repairs are usually not a problem, at most independent repair shops. The Troy-Bilt string trimmer product line is divided into straight and curved shaft trimmers, which come available both as 2 stroke and 4 stroke engines. Model TB10CS is the lowert proced trimmer Troy-Bilt has to offer, with a 31cc 2 cyscle engine. The curved flexible shaft powers a low cost bump head, which releases line when tapped against the ground. Starting is made a little easier with the ‘spring assist’ pull rope starter, which uses springs to reduce kick backs. A standard adjustable D-handle is also present. The price for this low end homeowner machine is $95.00. Moving up a notch in the 2 stroke engine trimmers. 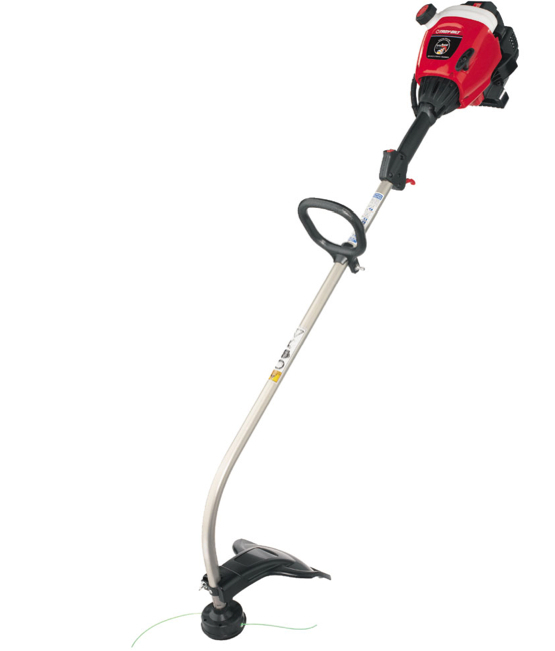 the Troy-Bilt string trimmer Model TB22 EC is a curved flexible shaft trimmer with a 25cc engine. This model has the option to use the “Press 2 Start” external electric starter, which is sold as an accessory. An electric starter is a big plus for those who lack the strength or stamina to pull an engine over until it starts. The cutting head has been upgraded to a dual line ‘Speedlock” head. Attachments are available. Added features bring the price of this machine to about $100.00. Troy-Bilt string trimmer TB80 EC represents the most expensive 2 stroke trimmer Troy-Bilt has to offer. The engine has been upgraded to 27cc, and is a full crank design, which means longer engine life and more dependability. The starter has the Spring Assist feature, and has the capability to utilize the optional external electric starter. The straight shaft drives a dual line “Speed Lock” cutting head. Attachments are available. The price is about $130.00 for this ‘best-built’ 2 stroke trimmer. Starting with the Troy-Bilt model TB525 EC the remainder of the product line consists of 4 stroke engines. The cost takes a noticeable jump, due to the increased complexity of a 4 stroke engine. However, the exhaust emissions are considerable less, making for a more environmentally friendly machine. The TB525 EC is the lowest price 4 stroke trimmer, and is powered by a 29cc engine. The shaft is curved, and is tipped with a “Speed Spool” bump head. The pull rope starter has the capability of the external electric start. This trimmer is attachment capable. This basic 4 stoke trimmer lists for about $180.00. The Model TB575 EC is a very similar machine, but is equipped with a straight shaft powered by the same 29cc 4 stroke engine. The cutting head remains “Speed Spool”, and “Press 2 Start” capability is also present. The list price is $200.00. If a lower cost trimmer that can be used as a brushcutter is desired, then the Troy-Bilt model TB590 EC may be right for you. An addition of a J-handle and 4 toothed steel blade allows for making short work of tall, thick grass in no time at all. The engine remains 29cc, and the use of heavier diameter nylon line cutting head is also an option. The price is a reasonable $230.00. Topping out the Troy-Bilt trimmer line is the model TB590 EC , which boasts a 25cc 4 cycle engine with a full crank design. This is the best 4 stroke engine offered, and delivers less noise and more performance than other products in this line. A nylon line “Speed Feed” cutting head can be removed in favor of a steel blade when cuting brush. Attachments may be placed on this trimmer model. This top of the line Troy-Bilt will set you back about $240.00. You can feel like a pro at an affordable cost!